Meet us at the Farmers' Markets in Sydney (Eveleigh Market, Redfern) 2nd Sat each month or Canberra (EPIC Market, Exhibition Park Canberra) every Saturday morning. Who is Greenhill Organic Farm? We are the Oliver family and we own and run Greenhill Farm. Greenhill is 1100 acres of paradise near Bungendore, NSW. From our hilltops you can see Lake George about 10km away. Why is our organic, grass fed beef better? Do you want your family to eat meat you know is free from chemicals? Are you sick of paying good money for beef that is a tenderness and taste lottery? Do you wonder if your meat is produced ethically - from contented animals grazed with sustainability as a priority? Please look around our site and see if Greenhill farm should be your personal supplier of quality certified organic/biodynamic beef! Buy superb organic beef direct from the farmer. We are a Demeter certified farm that follows national organic standards as well as the Demeter biodynamic standards. 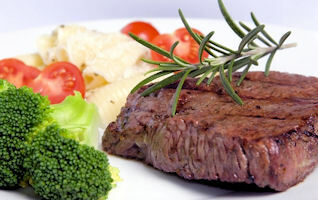 Read how to cook various cuts of beef the right way. Recipes coming soon. 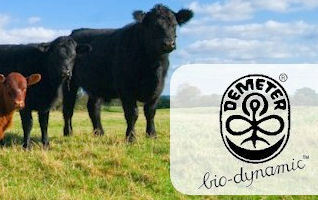 Buy grass fed, certified biodynamic beef direct from the farmer.